The city of Austin enjoys a rich community of birth professionals who work with expecting mothers and new parents to provide a truly diverse array of services ranging from childbirth education classes to placenta encapsulation. As an expectant Austin mama, the options available to you for all of these services, the wealth of information for you to consume, and the various decisions to be made during your pregnancy, may quickly become daunting. Austin’s premier center for new and expecting parents, AustinBorn, offers all of these in one place as well as a community of support to guide you through those maternity months and into motherhood. Phyllis Brasenell, originally in private practice as a birth doula, opened AustinBorn 18 months ago to offer a full range of services for new and expecting parents, over and beyond doula care. Phyllis has many years of experience working with women. As a social worker, she worked with pregnant teens and teen moms in inner-city Dallas followed by volunteering with the UN World Food Program in Ghana where she supported breastfeeding women and babies. She currently sits on the board of directors of Circle of Health International, a non-profit organization based in Austin, whose mission is to provide quality care to pregnant women and mothers with babies in crisis situations around the globe. As a birth doula, Phyllis has attended 78 births, and counting. I recently spoke to Phyllis to find out the full AustinBorn story. What is AustinBorn? What services are available for moms-to-be and new moms? AustinBorn is a place for parents. We offer boutique classes and services in a judgment-free atmosphere, from pregnancy all the way through early parenting. With birth and postpartum doula care, childbirth education, lactation counseling, postpartum fitness, midwifery care, placenta encapsulation, special workshops, and groups designed to build your community we have everything you need to hit your stride as a parent, whether it’s your first baby or fifth. What’s the story behind AustinBorn? What is it that drove you to creating it? I was a birth doula in private practice and noticed time and again the lack of community surrounding parenthood. Which seemed sad to me because it really does take a village to raise a child (cliche, but so true!). Having a family used to be a very social endeavor– you’d have the help of grandparents, neighbors, aunts, uncles, etc. but more and more the entire responsibility is shouldered by just one or two parents and it’s an unrealistic expectation. I also noticed how often I was referring clients all over town for different services and I thought there had to be a way to meet both needs: the desire for a support network with the convenience of one-stop shopping. As an expecting mom, how can I get to know all about AustinBorn and everything it has to offer me? We update our website calendar with every class and group that’s being offered; it’s also a great idea to follow us on Facebook and subscribe to our event feed to stay up to the minute! We’re just north of downtown at 5555 N. Lamar Blvd (Suite C-127) which we’ve found is easier for folks to get to than our old location. Plus, we have so much more parking! Do you offer the full spectrum of doula care – antepartum / postpartum services? Absolutely! We provide non-judgmental guidance not only through birth but also loss/stillbirth (whether elective or spontaneous) antepartum, and postpartum periods. How many doulas are on staff? We’re a team of three birth doulas and two postpartum doulas. For birth especially, I felt it was super important to keep our team small & intimate. Because we share a call rotation for labor support, being selective in our number means our clients can get to know each of us before birth which is something simply not possible with a larger group. Is there anything new on the horizon for AustinBorn that you’d like to share? Always! We’re constantly adding to our offerings based on what clients are wanting and needing. As our core base has grown, we’ll be adding groups geared toward parents of older babies. Specifically, beginning mid-November we’ll have The Circle for mamas of crawlers & walkers. 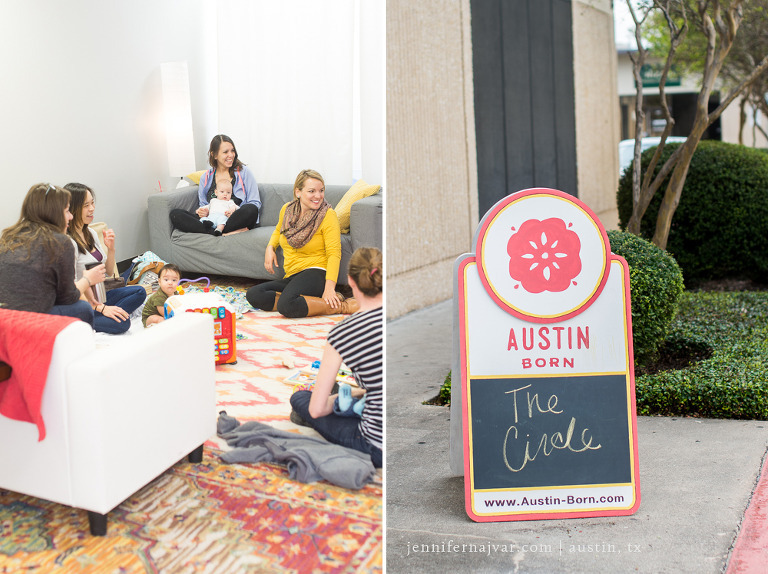 The Circle is our drop-in postpartum group and one of our most popular community offerings. It’s a supportive place for when motherhood isn’t Pinterest perfect and I’m thrilled we can continue to create that kind of space beyond the first few months postpartum. ‘She believed she could and so she did’ seems to be an important motto or message to the women you’re working with at the center. AustinBorn consistently shares news and information to educate pregnant women. What are you trying to encourage women to do differently? We really want the families who come to us to think for themselves and believe in their abilities. We have a diverse spectrum of clients –mamas birthing in hospitals, birth centers, and at home, with epidurals and without, breastfeeding, formula feeding, staying at home, working outside the home, etc– and our job is to foster an environment that encourages families to know what their options are and then make the best decisions for themselves. Period. No mommy wars. No one-size-fits-all care. What led you to becoming a doula? I’ve always worked with women and was naturally drawn to doula care. Okay, okay, I did have a stint in the corporate world for a few years but quickly came back. As a social worker, I worked with pregnant teens and teen moms in inner-city Dallas followed by volunteering with the UN World Food Program in Ghana where I supported breastfeeding women and babies. To tell the truth, I initially planned on being a doula for just a couple years and then starting midwifery school but once I saw what a unique role the doula plays in supporting birth, I knew it was where I was meant to stay. I’ll be at a scheduled cesarean this Thursday and that’ll be my 78th! I seriously learn something from every single one. I understand that Doulas do not provide any type of medical care, but they are knowledgeable about the labor and delivery process. What is your educational background? I have a bachelor’s degree in Sociology and a Master’s degree in writing. I trained and certified with DONA, which educated me in the patterns of normal, low-risk labor and birth. A lot of what I do is self-led by constantly staying up to date on the latest research and evidence plus lots and lots of on the job learning and continuing education workshops. A lot of moms I know have gone through their entire pregnancies having never sought out the services of a center like AustinBorn. Why do you think this is an important resource for women? I want women to believe in themselves again. That may sound trite but the truth is, we’re bombarded every single minute with marketers and advertisers telling us we’re not good enough (big thighs! thin hair! problem skin!) and we certainly don’t know how to mother (insert latest high price baby gadget here). Our resources are important because they remind women and their partners that they already have everything they need to raise their baby, if they’d only trust their instincts. You’re a small business owner. 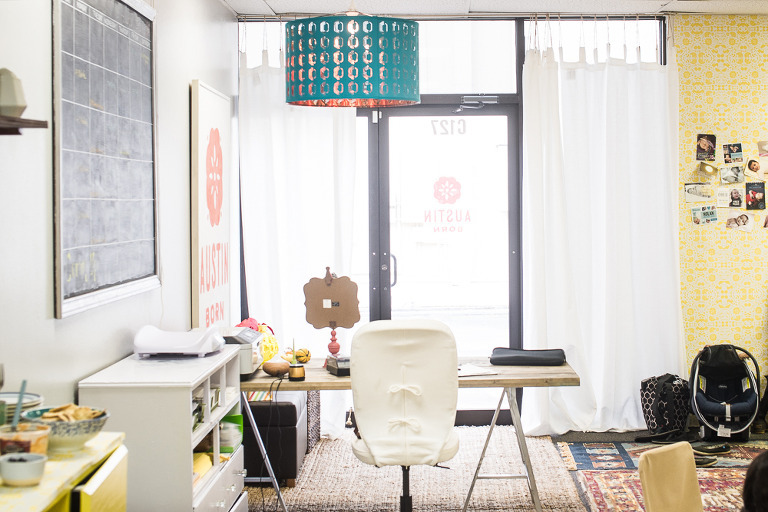 How do you balance the responsibilities of running AustinBorn and practicing as a doula? Do you sleep!? The million dollar question! It is incredibly hard, no lie. Even though we share a call rotation for labor support, supporting birth is still exhausting and very disruptive (the hours are crazy unpredictable and often crazy long) and on top of that running a business is a full-time job in itself. Right now, I try to take my own advice and practice self-care. I find if I stick to my boundaries (no answering text/voicemail/email after 5:30) and integrate something that feels good to me (exercise/meditate/read daily + yoga weekly) then the time that I do spend working is actually far more productive than if I burn the candle at both ends. I’ve also practiced the art of saying “no” to things that, frankly, don’t fulfill me. And, finally, I drink a lot of coffee and have stacks of sticky notes and Trello boards. What kind of licensing/certification/education is required to be a doula? Doula care as a profession is still catching on and certification isn’t required. But I do think it’s helpful to have formal training and education to be a practicing doula. The biggest difference is that doulas don’t provide any medical care, whereas midwifes are trained healthcare providers (just like an Ob/Gyn). Because we don’t have to be tasked with caring for the health of mom & baby, we’re free to provide physical, emotional, and informational support to the laboring woman and her partner. What do you think of the state of the birth community in Austin? How many people are using doulas? Do you think it’s becoming more widespread? It seems to be a more and more commonly discussed option, whereas, five years ago, I rarely heard people talking about it. Definitely doulas are becoming mainstream. It helps that Austin is a progressive city and medical care providers are supportive of our inclusion on the birth team. ACOG also published an official endorsement in 2014 of professional labor support as the #1 way to improve outcomes in maternal care and reduce primary cesareans, which was a huge boost to our field! What about the father’s role? Do you think that by having a doula present throughout the entire labor/delivery, the father is left out? Actually, it’s the opposite! Even the most skeptical partners end up being our #1 cheerleaders once their baby is born. Our role is to facilitate dad in caring for his partner while she labors and we often hear dads say they were actually able to be more connected and present because we helped take the pressure off them. The fact is, most men have never seen a woman in labor and no matter how many classes & books they have under their belt, in the moment when emotions are high, they’ll forget what they learned. That’s where we step in to cue them on ways to comfort mama and also reassure him that everything is going fine. And if things aren’t going smoothly, explain and help them understand what’s happening. No one would send their quarterback to the Super Bowl without a coach, right? What should a mother consider when choosing her doula? Personality! I recommend choosing someone you could be stuck in an elevator with. No, really! In labor, you’ll want someone you can trust and crack a joke with but also feel 100% comfortable around for long periods of time because you’ll probably be naked. Physically and emotionally. Does everyone benefit from a doula? Is it much more beneficial for difficult pregnancies? With a problem-free pregnancy, is the cost of hiring a doula still worth the investment? I do think everyone can benefit from a doula, though I’m obviously biased. It’s like going to a foreign country where you don’t speak the language; you can show up and probably have a good time but wouldn’t it be so much more enjoyable and less stressful to have a guide who speaks the local language? Doulas are for women who want to be an active part of their care, regardless of where or how they plan to give birth. And, again, do it for your partner! Like raising a family, birth also used to be a social event where a laboring woman was surrounded by supportive and knowledgeable family & friends. We fill that gap. I feel like I owe it to my profession to talk about cost. I often hear that doulas are too expensive but I ask people to think about how much their boss would have to pay them to go to sleep with their phone every night, answer it at anytime, and go to work for an indeterminate number of hours (often at3am and/or on weekends and holidays). Doulas are drawn to this profession because they’re passionate about it but having a big, caring heart doesn’t mean you shouldn’t make a living wage. Unfortunately, our burn-out rate is incredibly high with the average doula lasting only 2 years due to the hard hours and low pay. If we want to have professional doulas who are experienced and have a refined skill set, we have to make the work sustainable. That starts with doulas recognizing their own worth and parents valuing their services.